Ann and Nancy Wilson, along with their band HEART, will return to the road in 2019 for the first time in a few years. Their huge tour, aka the ‘Love Alive‘ Tour, will be their North American summer tour and the fun starts on July 9th when they begin their trek in Saint Louis at the Hollywood Casino Amphitheatre. Produced by Live Nation, the large tour is a 39 city trek by the trend-setting, multiple-platinum Rock And Roll Hall Of Fame legends will make stops in Chicago, Atlanta, Houston, Denver and more, before finishing up on September 9th at the famous Hollywood Bowl in Los Angeles, California. HEART will be joined by JOAN JETT & THE BLACKHEARTS, Sheryl Crow and Brandi Carlile while they are on the road this coming summer. Along with the great lineup, also appearing are Elle King and Lucie Silvas. Not all performers will be with HEART through out the entire tour. Select entertainers will be at each show. Tickets for the events go on sale to the general public on Friday, February 15th at 10am. Citi is the official presale credit card for the tour. Citi cardmembers will be able to get presale tickets starting on Wednesday, February 13th at 10am until Thursday, February 14th at 10pm through Citi’s Private Pass program. Look below for all the latest official Heart tour dates, links to look for tickets, plus some popular music videos by Heart. Ann and Nancy Wilson, along with their band HEART, will return to the road in 2019 for the first time in a few years on their Love Alive tour. 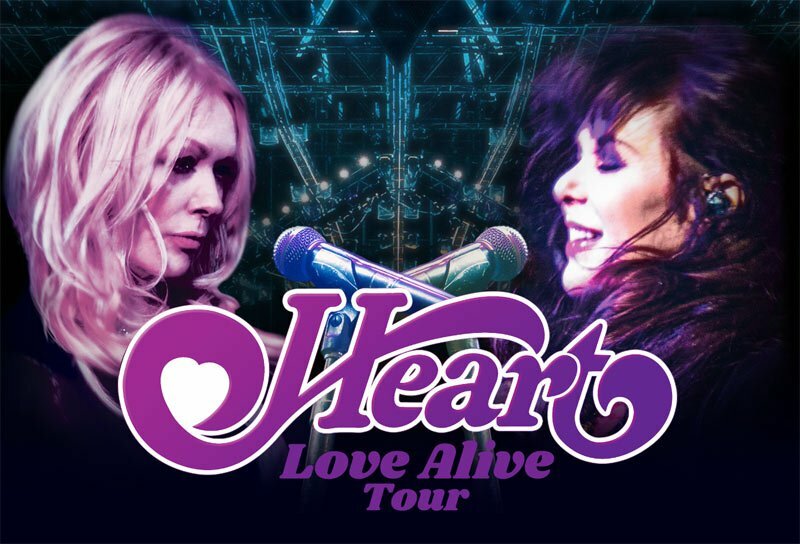 Even though HEART has plotted out quite a large tour, check back often to see if they add more dates to their 2019 ‘Love Alive’ Tour.